This petition has been created by Swedish Society for Nature Conservation, Gothenburg . and may not represent the views of the Avaaz community. Swedish Society for Nature Conservation, Gothenburg . Swedish based company “Stena” is making billion dollar investments in drilling vessels which are specifically designed for use in the Arctic. CEO Dan Sten Olsson claims that continued exploration and use of fossil fuels for several more decades will pose no threat to climate stability and that the risks of climate change are exaggerated. In contrast, the global scientific community speaks with clear voice that human activities contribute to dangerous climate change. Oil drilling in the Arctic is not only a high risk project in itself, it also leads us down a dead end road. The world has more than enough of already known fossil fuel reserves. The International Energy Agency (IEA) states in their “World Energy Outlook 2012” that no more than one-third of already proven reserves of fossil fuels can be consumed prior to 2050 if the world is to achieve the 2 °C goal. Temperatures beyond a 2 °C increase in global average will lead to significant water stress and sea level rise. Emissions of greenhouse gases are generated in developed countries and regions with high living standards but the consequences are mainly striking poor people with no means to protect themselves. 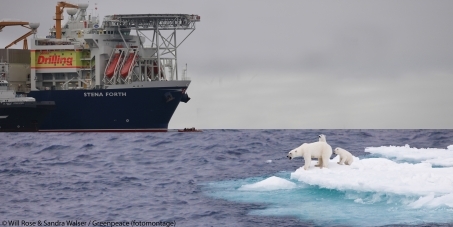 The arctic region is one of few pristine environments in the world and also a high risk area for deep water oil drilling due to weather conditions such as extreme cold, hurricane-strength storms, pervasive fog and extended seasons of darkness. A report released by the U.S. Geological Survey in 2011 identified major gaps in Arctic science and research, emphasizing that significant questions remain regarding the scientific and technical information needed to adequately prepare for drilling in the challenging Arctic environment. The ultimate consequence of successful missions will be even more fossil fuels ready to be burned, which will directly undermine the absolute necessity of curbing global CO2 emissions. What consequences a non-successful mission will have we can only imagine. The ability to adequately respond to a major accident is completely dependent upon weather conditions at the time. Nothing but a game of Russian roulette. “We believe in the Stena way, that´s why we act within our values, showing respect for the environment and the communities in which we work.” This is what Stena themselves expresses on their website regarding their responsibilities. Your voice is critical to make Stena live up to their own expressed values and put their money where their mouth is. Help us to urge CEO Dan Sten Olsson to stop all their investments in arctic oil drilling and say no to future missions in the Arctic.